These include the Wellness Guide, Destination Calendar, 2018 Calendar of Events. The 2017 Caribbean Tourism and Hospitality Investment Guide, a bi-annual publication of the Caribbean Tourism Organization (CTO), showcases a wide range of investment opportunities in the tourism and hospitality sector in CTO member states and lists incentives that Caribbean Governments are offering to attract new business. Click here to buy electronic copy of the 2017 Caribbean Tourism & Hospitality Guide with Paypal. 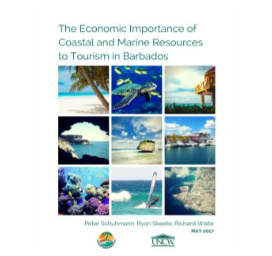 The Economic Importance of Coastal and Marine Resources in Barbados. The Economic Importance of Coastal and Marine Resources in Barbados in collaboration with the University of North Carolina at Wilmington and World Resource Institute. This report summarizes the results of an empirical study of tourists’ preferences, activities in the coastal zone, and willingness to pay conservation fees to manage coastal and marine resources in Barbados. This information can be used to identify and develop financing mechanisms for sustainable tourism development and allocate budgetary resources to outcomes that provide the highest return on investment. This Caribbean Tourism Legislation Database is intended primarily as a service to CTO members, although clearly it will also be of assistance to the numerous academic institutions and individual researchers who make use of the Organization’s Documentation Centre. It is meant to serve as a ready and easy-to-use reference source on regional tourism legislation available at CTO Headquarters for consultation. This is a list of sustainable tourism web resources throughout the region and internationally. It includes contact addresses and links to various environmental organisations nationally, regionally and internationally; NGOs, private sector organisations; important websites, conferences, research, sources of funding, research and training institutions etc on sustainable tourism development. It is the intention of the Caribbean Tourism Organization (CTO) that this document provides its members, primarily the National Tourism Organisations (NTOs) in its 32 member states, with a Policy Framework to guide the sustainable development of tourism. Cadre Stratégique pour le Tourisme Durable Caribéen L’Organisation du tourisme de la Caraïbe souhaite que ce document fournisse à ses membres -principalement aux Organisations Nationales du Tourisme (NTO) dans les 32 Etats membres- un Cadre Stratégique pour guider le développement durable du tourisme. In April 2003, the Caribbean Tourism Human Resource Council (CTHRC) contracted Dr. Ethley D. London and Dr. Denis F. Paul to develop a Quality Assurance Framework for tourism and hospitality programmes in the region, which will ensure that the programmes and graduates meet acceptable standards and to promote a uniform and consistent level of educational quality. These include training modules and guides, workbooks and worksheet on subjects ranging from customer relations and supervisory management to managing sites and attractions. There are also CDs and children’s tourism magazines. The Common Core Curriculum, a component of the Caribbean Tourism Learning System (CTLS), has been developed in the core speciality areas: Hospitality Studies, Food & Beverage Studies, Resort Studies, Tourism Studies, Culinary Arts Studies, Business Core studies and the Elective courses. Click on the links below to view the Core Curriculum Guides. The publication “The Associate Degree in the Caribbean with particular reference to the OECS”, co-ordinated by the TLIU of the University of the West Indies, Cave Hill Campus, is proposed as the guide for the General Education courses. It can be obtained from the UWI, Cave Hill Campus website. Click on the links below to view the Associate Degree Guides. This report is an output of the 8th European Development Fund (EDF) Caribbean Regional Sustainable Tourism Development Programme (CRSTDP), which is a five-year (2003-2008) programme funded by the European Union. View Natural Hazard Risk Management in the Caribbean Tourism Sector report. This manual is an output of the 8th European Development Fund (EDF) Caribbean Regional Sustainable Tourism Development Programme (CRSTDP). View “Competing With the Best” manual. Bonnes pratiques en matière de tourisme communautaire dans la Caraïbe La Caraïbe dépend davantage du tourisme pour garantir des revenus que toute autre région du monde. La mondialisation a eu pour résultat que la plupart des petits États insulaires de la Caraïbe sont limités vis-à-vis de leurs autres options économiques. View “Competing With the Best” (French) manual. Goede werkmethoden in het Caribisch Gebied inzake het toerisme dat de eigen gemeenschap ten goede komt (het gemeenschapstoerisme) ‘Toerisme dat de eigen gemeenschap ten goede komt’ (‘community-based tourism’) is geen nieuw begrip. Hoewel er in verschillende bestemmingen in Afrika, Latijns Amerika en Azië internationale ervaring is vastgelegd, is het ‘toerisme dat de eigen gemeenschap ten goede komt’ niet erg bekend in het Caribisch Gebied. View “Competing With the Best” (German) manual. The purpose of these good practice guidelines is to assist tourism companies to contribute more to the local economy. The intended audience is tourism businesses of various sizes and operational types. Other guidelines already describe the ‘what and why’ of more responsible or sustainable tourism. These guidelines focus on practical tips on how to do it. This report presents detailed profiles of 20 niche tourism markets. All of these niche markets are already available in many Caribbean countries, although their level of product development and sophistication varies. Information on successful national tourism awareness programmes being implemented in CTO member countries. Community Tourism in Dominica: Dominica will pursue sustainable tourism that enriches the lives of all citizens by economic, social and cultural opportunities, protecting the natural resources and scenic, heritage and cultural features of the country, nurturing community involvement in tourism. Best Practices in Tourism Management— PowerPoint presentation by McHale Andrew, CTO/CRSTDP Advisor at the CTO/CRSTDP Statistics and Information Management Workshop, October 2005.